With an overwhelming variety of striping and lettering brushes available, the right choice for your specific application can be difficult and confusing (even for advanced artists!) 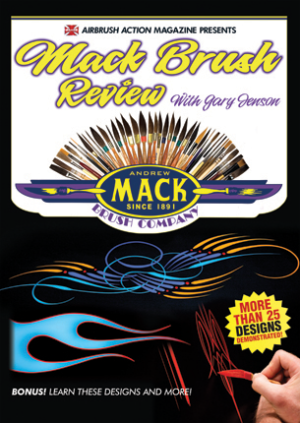 In this DVD, pinstriping master Gary Jenson unlocks the mystery and confusion of striping, scrolling, and lettering brushes by demonstrating the use of each brush in the extensive Mack Brush Company line, including: Mack 10 Series Sword Striper, Mach One Striper, Mack Lite Striper, Mack Belly, Mack SLS, Mack 1010 Series Sword Striper, Xcaliber Sword Striper, Kelly Mack Sword Striper, 179 Lettering Brush, 189 Lettering Quill, 169 Lettering Quill Series, 1992 Soft Flat Stroke Series, Scrolling Script Brushes, Bobbo Super Quad, Wizard Vortex, Wizard Typhoon, Jenson Swirley Q, 444 Virus, Virus II, Alan Johnson Mini Detailer, Ron Meyers Car Show Set, Series 840 Outliner In this DVD, you'll learn how to: Palette a brush, Tell if your brush is overloaded, Pull a straight and consistent line, Trim a brush, Achieve thin and thick lines, Paint great designs, End a line Anatomy of a brush, The various synthetic and natural brush hairs, Outline flames and letters, Hold a brush, Make seamless line connections, Why the differences in hair lengths, Lettering quills, and flats Block, freehand, script, and casual lettering, Pull straight Lines Perform teardrops, scrolls, and signatures, Make a dagger stroke, Wet-on-wet blending, Anatomy of a Sword Striper, The numbering system of sword stripers, Rudder action of a brush, Clean and maintain your brushes, And more! The market for custom pinstriping has exploded. In an age when virtually all vehicles "look alike", owners want that distinctive touch that sets their cars or truck a breed apart. Those who practice the art professionally command large incomes. You can be one of them. There is also a tremendous satisfaction in learning pinstriping for personal satisfaction....and applying it to your own vehicle and those of friends. 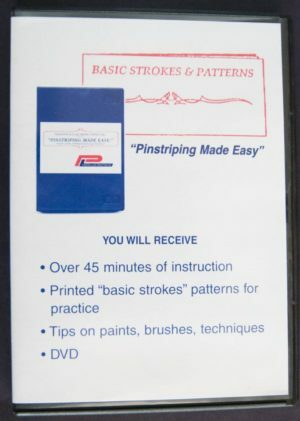 Presented by masters of the art with 30-years combined experience is a step-by-step instructional videotape....complete with practice patterns of the simple basic strokes from which all professional pinstriping is derived. 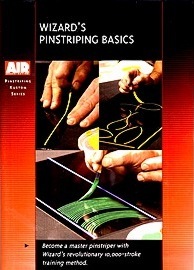 Whether for profit or for pleasure, "Pinstriping Made Easy" by Pinkston & Lusk is the answer, leading you through the process in an entertaining easy-to-learn manner in the comfort of your own home using your TV and VCR. 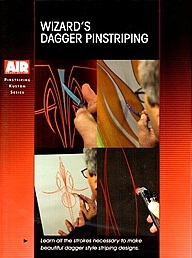 Learn all the strokes necessary to make beautiful dagger style striping designs. This video includes, paletting techniques, how to roll the brush, how to pinstripe a circle, painting without a grid, asymmetrical and symmetrical designs, and tons more. Here's the ultimate guide for beginning to intermediate pinstripers and artists alike. 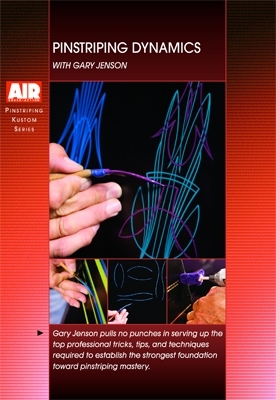 Featuring Gary Jenson, one of the World's best as your guide, this presentation pulls no punches in serving up the top professional tricks, tips, and techniques required to establish the strongest foundation toward pinstriping mastery. As a special added bonus, gold leaf pinstiping is included! 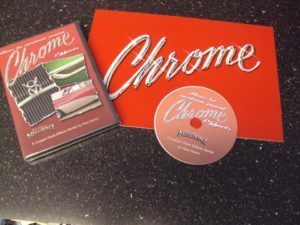 Nationally known airbrush and pinstriping artist and instructor, Paul Quinn, owner of Design Brilliance LLC, announces the release of a new instructional DVD "How to Custom Paint Chrome Effects". Paul walks you through the process of painting a dimensional faux chrome molding and its practical application on a vehicle. You"ll learn the products, tools and techniques needed to create this stunning effect. 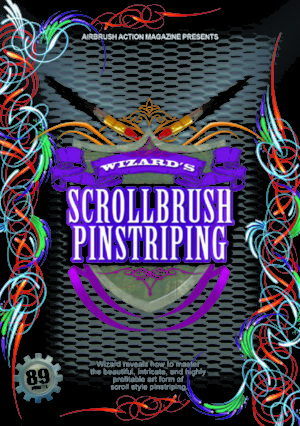 Scroll style pinstriping is the fast track to big profits and Wizard reveals all about how to master this intricate art form through a series of designs on panels and a gas tank. This highly detailed step-by-step course is geared toward beginning to advanced artists. Scroll style pinstriping is the most elegant, yet difficult style to master. I have seen many failed attempts at this elusive style, and sympathize with anyone who has picked up a scroll brush and "gave it a whirl". The instruction contained in this video is a result of 45 years of experimentation and perfection of the scroll style. I will show you, through a 2-part instructional session the secrets I have learned and the shortcuts to pinstriping mastery. You CANNOT learn the scroll style by picking up a brush and expecting magic to happen. There are principles and movements necessary to execute good scroll designs. If you have tried and failed, this video is for you. If you have been trying to design scroll styles, but only end up frustrated, this method can help you. Tired of copying someone else's style? This video is for you. Learn to scroll like a master - have the confidence that every time you pick up the brush, you will design beautiful scroll style pinstriping every time. 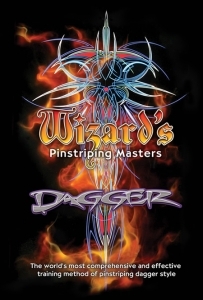 Dagger style pinstriping is the a beautiful way to enhance any vehicle. It is the most popular and most profitable thing I've done for the past 45 years. However, symmetry, design capability and line quality are the three elements that most often elude the beginner and veteran alike. How do you stay consistent, sharp, and imaginative in your work? How do you find new directions to take your work? I have revealed my "PRACTICE FACTORY" method that I still use to keep sharp. I also show how to practice and work THROUGH difficult distractions- situations that will stop a pinstriper in his tracks. 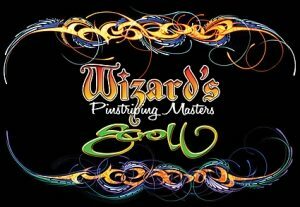 this video shows how to raise the bar and learn the secrets of pinstriping masters- secrets that I have collected in my long, wonderful and successful career. I welcome you into my shop and into my "head" as I share personal secrets, thought processes, and maneuvers that I have developed and learned from other masters. You will enjoy this video every time you view it, and your growth will be apparent immediately as you make progress faster than ever before.